Today I am presenting a very healthy and tasty stir fry recipe prepared with Chenathandu (ചേനത്തണ്ട്‌, elephant yam stem) right from my kitchen garden. It is very healthy and of course free from all pesticides, 100% organic. 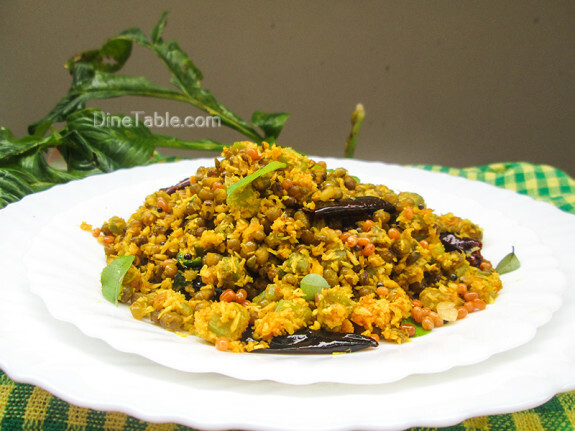 Chenathandu Cherupayar Thoran Recipe / ചേനത്തണ്ട്‌ ചെറുപയർ തോരൻ / Elephant Yam Stem and Green Gram Stir Fry is a nice stir fry recipe for Kerala / Onam sadya. I got this recipe from my mother. As she plants most of the vegetables in her garden, we need not have to go to market for vegetables. Luckily, I do have a little kitchen garden which gives me a proud feeling. 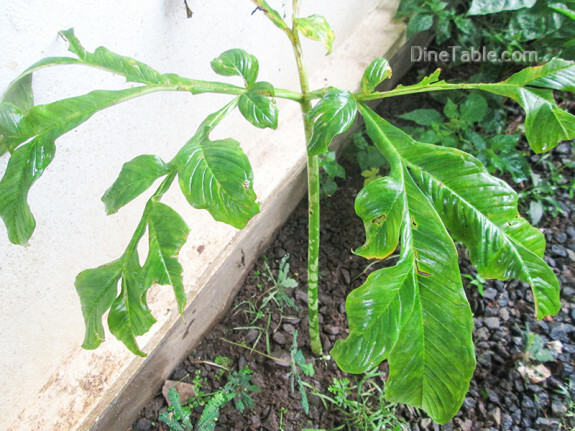 Almost all parts of the elephant yam plant is edible. Even the leaves can be used to prepare stir fry. 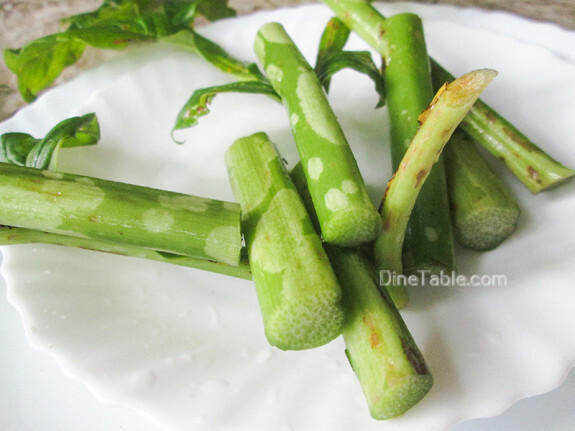 I have used the stem of the plant to make the thoran / stir fry. 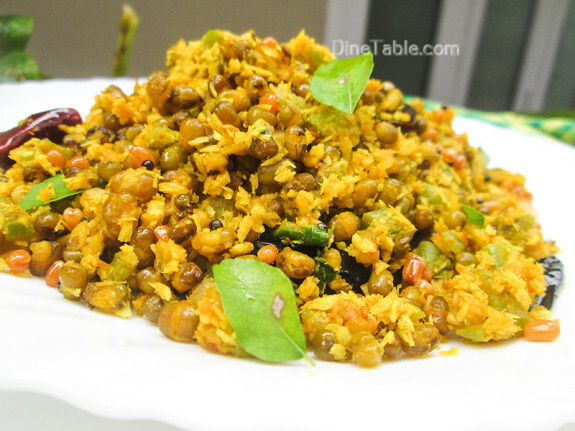 I have added cherupayar (ചെറുപയർ, green gram, moong dal) and urad dal (uzhunnu parippu, ഉഴുന്ന് പരിപ്പ്) which enhance the taste. It had high fibre content. With its high fiber and nutrient content, it offers a number of health benefits. 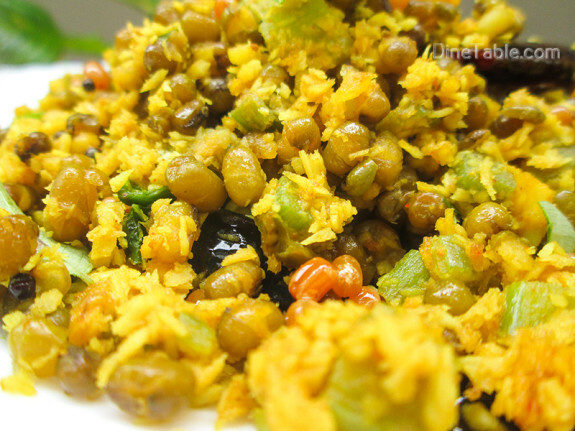 Click here for other healthy and tasty stir fry recipes..
Wash the green gram well with water. Soak green gram in 2 cups of water for 20 minutes and drain. Cook the green gram in a pressure cooker with 1 1/2 cup water and salt. Heat 5 tsp of coconut oil in a pan, add mustard seeds, urad dal, dry red chilies and curry leaves. Once the mustard seeds start to splutter, add the chopped chena thandu, turmeric powder and salt. Stir well for 3 minutes. Cover and cook for 3 minutes. 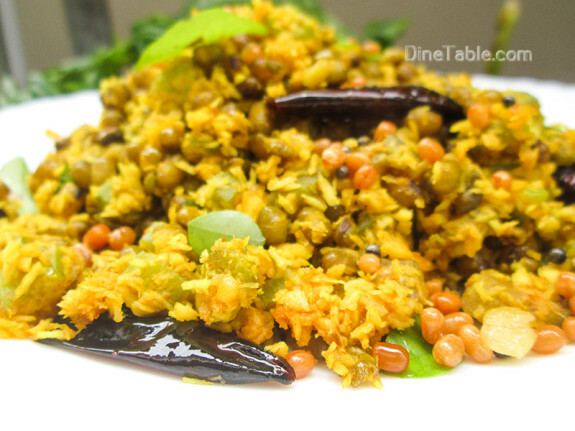 Coarsely grind the grated coconut with green chilies, cumin seeds and garlic with a mixer grinder. Add the coconut mix to the cooked elephant yam stem and mix well. Cover and cook this on a low flame for 3 minutes. Remove the lid and add the cooked cherupayar. Stir well and cook for 2 minutes till it is dry. Switch off the flame. Tasty Chenathandu Cherupayar Thoran is ready.